In 1831 a young amateur scientist, Charles Darwin, boarded the HMS Beagle on an epic five-year voyage of discovery that would shake the world. In this expansive documentary the HMS Beagle once again sets sail as it retraces Charles Darwin’s voyage in lavish detail, examining his findings and remarkable conclusions and their implications in the light of modern knowledge. 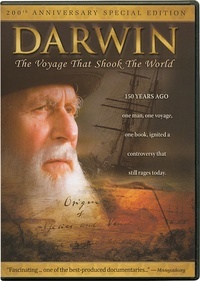 Filmed in South America, United Kingdom, North America, Australia and Europe, ‘Darwin: The Voyage That Shook The World’ features dramatic period recreations and stunning nature cinematography, all interwoven with scholars, scientists and Darwin experts who share differing perspectives on the man and the controversy he stirred.